By Lauren Fetherston | May 4, 2017. 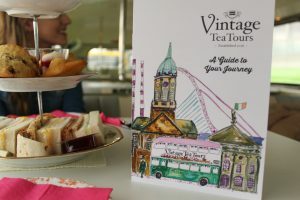 ‘Vintage Tea Tours’ offers a historical tour of Dublin with a unique and tasty twist – afternoon tea on a vintage bus. 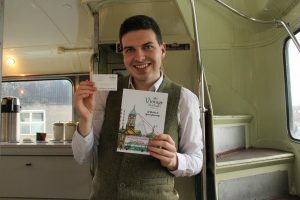 Sophie Clarke and Lauren Fetherston spoke with owner Karen Nixon and hopped on board the 1961 London Routemaster for a chat, tour and a lovely cup of tea. The green and cream vintage 38-seat bus is named Pauline after Karen Nixon’s grandmother, who inspired the business. This nostalgic feel is helped by the 1950s jazz music that plays throughout the tour. Pauline has a lot of history as the bus was previously gifted to wildlife artist David Shephard. The route begins at the CHQ building and travels through Georgian Dublin, St. Patrick’s and Christchurch Cathedral, Dublin Castle, Phoenix Park and past the Guinness Brewery – so it spends a lot of time in Dublin 8. The tour takes approximately 1.5 hours. We were greeted with a smile by the lovely driver Bob and then shown to our seats by the very friendly Jack. On our table was a floral, three-tiered cake stand with a selection of delicious snacks including chocolate mousse served in an editable chocolate mug, raspberry cheesecake, sour apple jelly cupcakes, fruit scones and a selection of sandwiches. We both tried their one of their special teas – rosé flavoured. The tour not only offers some history about some of Dublin’s top attractions, but it also creates some “special moments” by spending time with family or friends over a cup of tea. “The conversation between everybody and the diversity is exactly what I wanted. I always think that even the quietest person in the room has a story to tell”. Karen has recently purchased another vintage bus called Kitty after her other grandmother which will allow her to be able to do some “once-off special events”. She hopes to buy a third bus and do weekend runs to other parts of Ireland such as Galway and Cork. 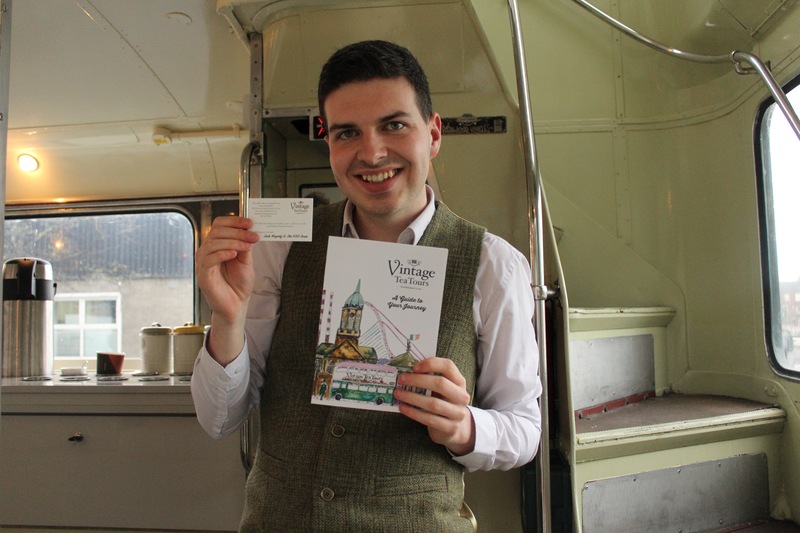 The tour runs Wednesday to Sunday at 11am, 1:15pm and 3:30pm costing between €40 and €50. It is a unique way of viewing and learning about our city while also enjoying some tasty treats and having a chat.